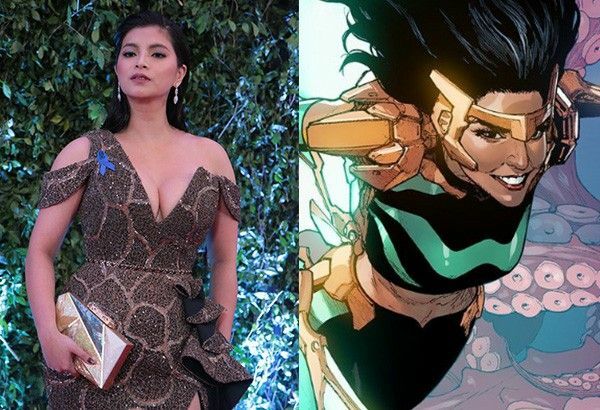 MANILA, Philippines — Kapamilya actress Angel Locsin was offered to portray Wave, Marvel’s first ever Filipino superhero. Leinil Francis Yu, Wave’s Filipino designer and co-creator, said he would love to see Angel giving flesh to Marvel’s first Filipina heroine whose alter ego has been named Pearl Pangan. “The General’s Daughter” star, however, declined the offer. Angel shared in a Twitter post that Wave’s weapon was based on what a Filipino hero historically used to defend the country from conquerors. I'm excited to learn more about this character! I ?? that her weapon of choice is a Kampilan, w/c is believed to be the sword Lapu-Lapu used to strike down Ferdinand Magellan. So, ???????? for that! Regarding her costume, I wonder what’s the inspiration behind the design? “I'm excited to learn more about this character! I (love) that her weapon of choice is a Kampilan, w/c is believed to be the sword Lapu-Lapu used to strike down Ferdinand Magellan. So, (thumbs up) for that! Regarding her costume, I wonder what’s the inspiration behind the design?” Angel wrote on her Twitter account. Leinil replied to Angel, saying the collaboration is between him, co-creator Greg Pak and the Marvel editorial team. “It’s a collaboration of ideas between me, greg and Marvel editorial:). Would love to see you as wave, Angel!” Leinil replied. Social media users entertained the fact that Angel might be the first Filipina to be in the Marvel Cinematic Universe, but the actress turned down the idea. Dubbed as the country’s “Action Drama Queen,” Angel also declined offers to once again don the costume of Filipina superhero Darna since she just recovered from a spine injury. Marvel unveiled the first image of Wave early this month. According to reports, Marvel included Wave and other Asian superheroes in the comics series "War of the Realms: New Agents of Atlas" to be released this May.